Cuba Is First To Earn WHO Seal For Ending Mother-Baby HIV Transmission : Goats and Soda The chances are now practically nil. How did Cuba do it? And how are other countries faring by comparison? A pregnant woman in Cuba with HIV would be referred to a policlinico, like the one above, for specialized care. A woman has HIV. She becomes pregnant. What are the chances that she can deliver a baby who is not infected? In some countries, like Yemen, for example, only 11 percent of pregnant women with HIV receive treatment to prevent their babies from being infected. For women who aren't part of that fortunate group, the chance of passing HIV to their infant is as high as 45 percent. That doesn't mean Cuba is on a pedestal all by itself. By 2014, more than 40 countries were testing and treating more than 95 percent of pregnant women; some places, including Anguilla, Barbados, Canada, Montserrat, Puerto Rico and the United States, have likely hit the mark as well. 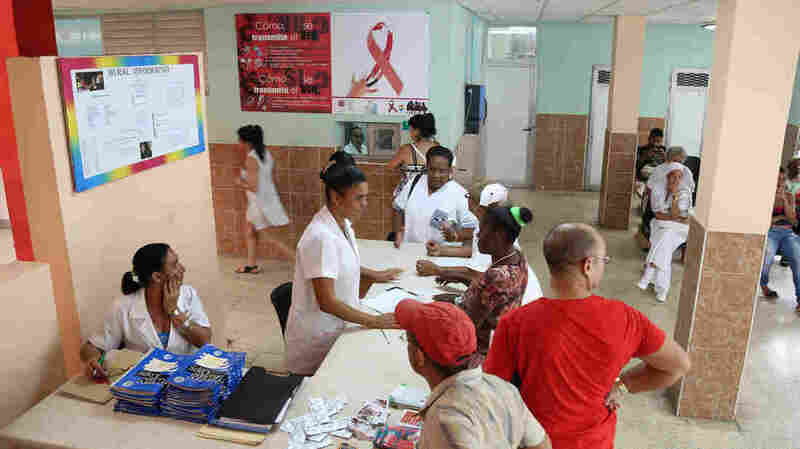 But Cuba is the first to go through the WHO monitoring program, which requires data on transmission for at least two years and an on-site visit by WHO members examining care in all parts of the country, including remote, impoverished and underserved areas. Here's how Cuba did it. 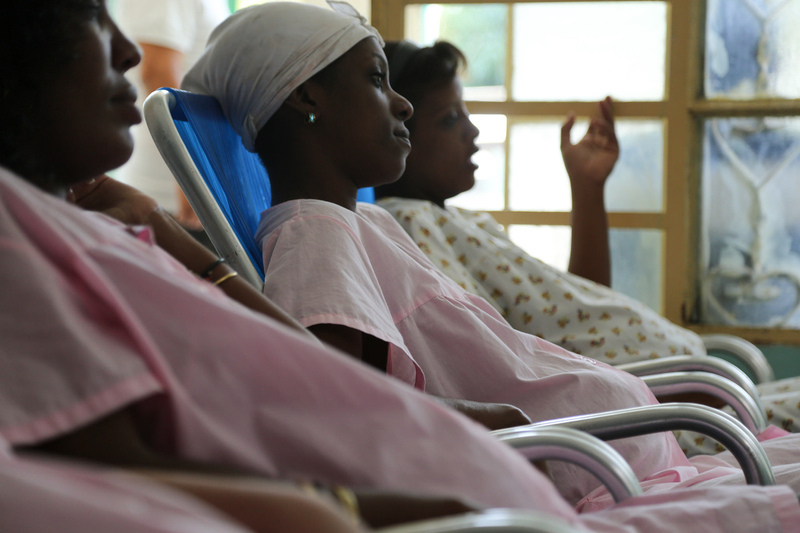 When a Cuban woman becomes pregnant, odds are extremely high she already knows whether she is infected with HIV. She was likely diagnosed at a family clinic near her home, and then referred to a policlinico, or a clinic with a higher level of specialized services, to monitor and treat her HIV, according to Sonja Caffe, regional adviser on HIV and the Pan American Health Organization, the WHO regional office for the Americas. If she is infected with HIV, when she becomes pregnant, she begins oral antiretroviral treatment, shown to prevent transmission to her newborn in 98 percent of cases. At about 38 weeks into her pregnancy, if she agrees, she gives birth by cesarean section, which has been shown to reduce transmission of the disease through the birth canal. To further protect the baby from the virus, she is counseled not to breastfeed her child and the child is given antiretroviral treatment for four to six weeks. The regimen, developed beginning in 1991 by the National Institutes of Health and the French National Institute for AIDS Research, can reduce the chances that the baby will be infected with HIV to less than 2 percent. And it's now being used by health services around the world. But Cuba became the first country in the world to receive WHO validation. "I think the rest of the world can learn from the way the system is designed in Cuba," says Caffe. "In Cuba, the health services are very close to the people. There is universal coverage, and the services are free. They don't simply invest in hospitals. There is a philosophy of bringing health care to the people in the community." The same system of care in Cuba helped to improve the population's health in other ways. "When you have a robust primary care system, you get other good results, like low infant mortality," says Caffe. And eliminating the transmission of syphilis from mother to child. About a million pregnant women in the world are infected with syphilis, which can cause miscarriage, stillbirth and serious complications in infants. Syphilis transmission to babies can be eliminated by screening and simple treatment, with penicillin, for example. This maternity home in Havana provides residential care for pregnant women with medical or social issues. In the United States, the rate of transmission of HIV through pregnancy and childbirth is below the 2 percent mark set as the WHO standard. But the U.S. has underserved pockets of health care in both rural areas and inner cities. "We visit municipalities, regions and specific sites within a country," says Caffe. The team looks at many areas of the country, including the lowest-performing health centers, to see if, even in those areas, good preventive care is provided. "In Cuba, it was difficult to identify the lowest coverage areas because it has very high coverage of preventive services in all areas," she says. That's not so true in the U.S., where rates of HIV transmission to infants are higher in poor, minority and underserved areas. "On a national level, the United States has already achieved the elimination target," says Caffe. "But a criteria for validation is that it be met in an equal manner, even in subgroups of the lowest performing areas." In 2009 in the U.S., 162 babies were born infected with HIV — far below the elimination standard, even for poor and minority patients. But while whites had a mother-to-child AIDS transmission rate of 0.1 per 100,000, and Hispanics a rate of 1.7 per 100,000, the rate among African-Americans was 9.9 per 100,000. As for the total picture worldwide, there were 240,000 babies born with the infection in 2013, down from 400,000 in 2009. WHO's goal is 40,000 a year, so countries still have a long way to go.